You can spend hours on dinner, use a dozen different ingredients, follow a million different steps - but the truth is, sometimes the best dinners are the simplest ones. 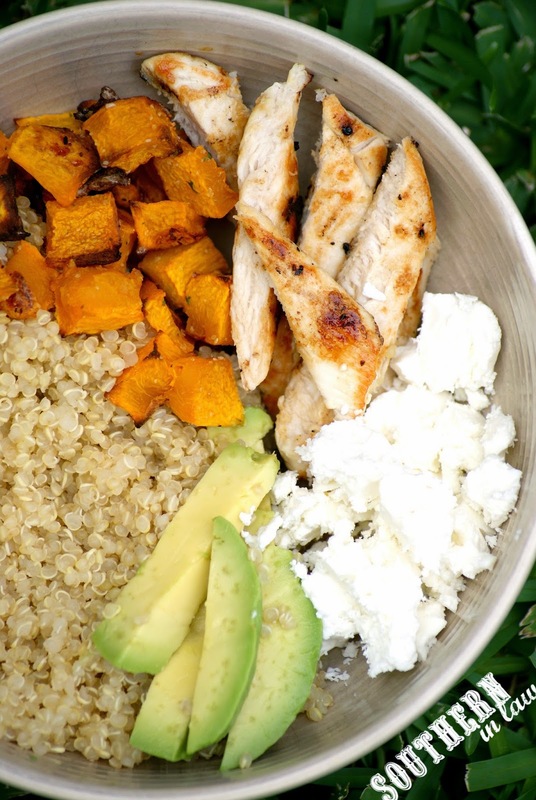 One of Jesse's favourite dinners is this quinoa bowl. It's actually quite funny that this is one of his favourites as he used to despise quinoa - simply because it was different. Then he saw me eating this a few times and asked if I could make it for the both of us and he's been hooked ever since. 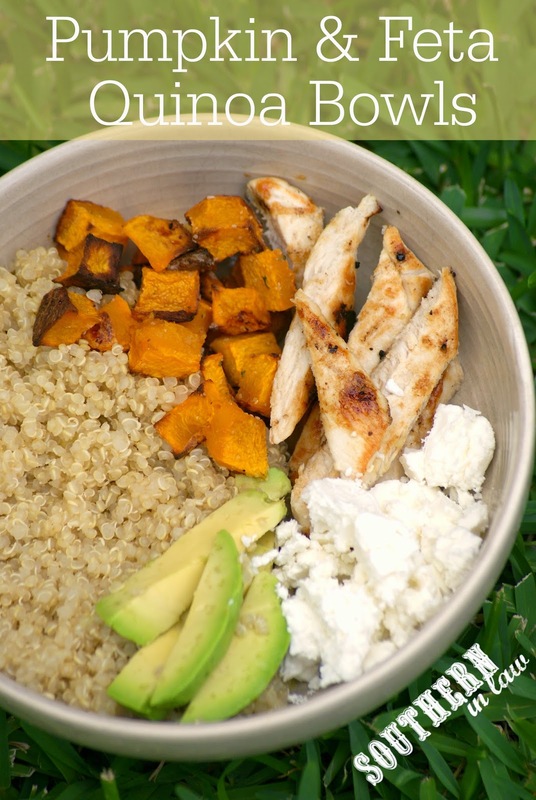 The ingredients in the bowl change, however, quinoa, roasted pumpkin and feta always remain the constant because it's a combination you just can't go wrong with. I love adding avocado to these bowls (because this girl has a serious avocado obsession as of late) whilst Jesse doesn't think it works (because he doesn't really like avocado) and often we'll add in some grilled chicken or crunchy roasted chickpeas (just add them in to roast with the pumpkin) for a protein boost. On nights where we're busier, I'll make up a big batch of quinoa on the weekend and either keep it in the fridge for a quick dinner base or freeze portions so they're ready when I need them. That way, all I have to do is roast the pumpkin and put everything together! easily adaptable - serves as many as you'd like! Bake your pumpkin for 15-30 minutes, depending on size, or until your pumpkin is soft in the middle and browned on the outside. If you're wanting to add roasted chickpeas to your bowl, add these in with the pumpkin. 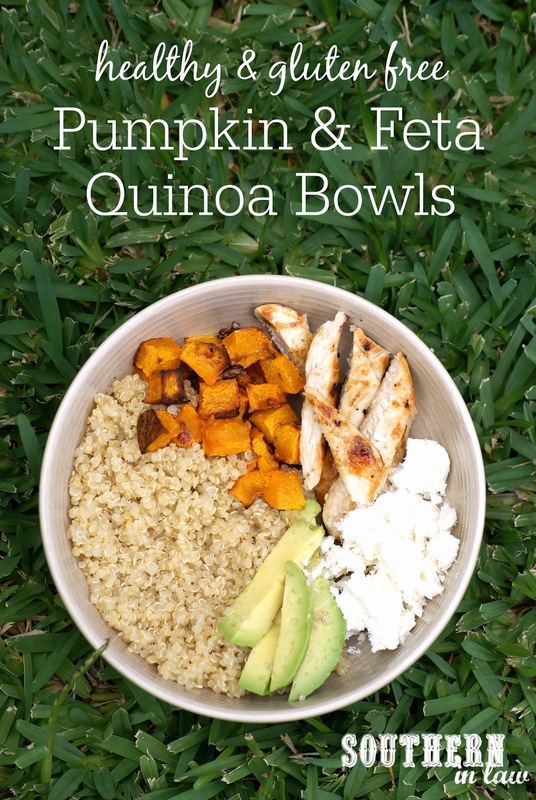 Meanwhile, whilst your pumpkin is baking, cook your quinoa if you haven't already. If you're adding grilled chicken or other meats you may want to cook these now as well so you're ready to assemble. Once your pumpkin is cooked and all of your other ingredients are ready, it's time to assemble your bowls! I like to layer my bowls with different sections of ingredients whilst Jesse likes his mixed together - the choice is yours! Get creative and add whatever your heart desires - baby spinach leaves, steamed asparagus, crunchy roasted chickpeas, tender grilled chicken breast, creamy avocado - the possibilities are endless! One of the best things about these bowls is that you get an awesome mix of textures and flavour! *You'll notice I don't use oil here when roasting the pumpkin, however, you are more than welcome to add in olive oil, coconut oil or an oil of your choice if you wish. We first started eating this during my very early days of coeliac diagnosis when I had even more food intolerances than I do now. I couldn't tolerate any oils at the time so I started roasting vegetables without oil and we actually came to prefer them made that way! But tell me, what are some dinner favourites in your house? And what's your favourite simple, quick and easy dish? Oh, I love feta! Thanks for this new way to try it! You and me both! Feta is one of my favourite ingredients! Oh girrlll you know this is my kind of meal! Quinoa fortunately made it back into my meals a lot more regularly, and since Selah's been so much more "trying", for lack of a better word, we've been satisfied with simple dinners like this too. Yayy!! Greg is slowly coming around to liking quinoa but it has to be done ONLY a certain way. ^_^ Hope you're having a blessed week, mah love! Hooray for husbands that are finally willing to try things haha. Jesse is just like Greg - he will only try certain things in certain ways! This turned out wonderfully! Took about 45 minutes to boil down. Used So Delicious Culinary Coconut Milk Lite. Love it! So glad you loved it, Angela! Is it vanilla powder or some kind of vanilla essence that is supposed to be used? Hi Rebecka, apologies for being so vague in the recipe! Just plain old vanilla extract is perfect for this recipe! You could also use vanilla essence - I just prefer the flavour of natural vanilla extract. Awesome! So glad you loved the recipe, Courtney! Was your caramel nice and thick or runny? The colour may have been either because the mixture didn't caramelise quite enough or perhaps the coconut milk being full fat and having a higher percentage of coconut solids gave it a creamier look.